This map activity allows students to review the major world regions and identify examples of societies, cities, empires, and/or civilizations that existed during the Post Classical Era (Era 3). 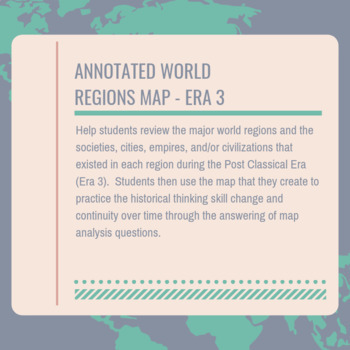 After labeling the map, students then use the map to answer two analysis questions, which focus on identifying major changes and continuities from the era. Two files are included in the zip file: map directions and a blank world regions map. 3.1.I - Improved transportation technologies and commercial practices led to an increased volume of trade, and expanded the geographical range of existing and newly active trade networks. 3.2.I - Empires collapsed and were reconstituted; in some regions new state forms emerged.